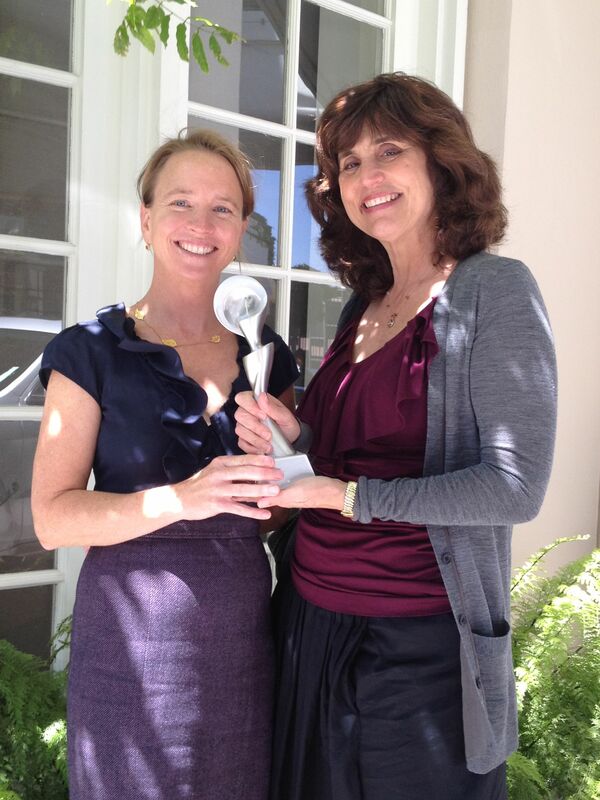 April 22, 2014 Mia HerronAwards, David Weinberg, Edward R. Murrow, Hollywood, Inglewood, KCRW, RTDNA, Sonya Geis, Which Way L.A.? LOS ANGELES, CA (April 22, 2014) — Today, KCRW won a 2014 RTDNA Regional Murrow Award for “Saying Goodbye to Hollywood Park” in the Audio Feature Reporting category. The feature, about the closure of the legendary Hollywood Park horse racing track in Los Angeles’ Inglewood neighborhood, originally aired on December 18th, 2013, on Which Way, L.A.?, and was produced and reported on by David Weinberg and edited by Sonya Geis. The segment is under consideration for the national award, which will be announced in June. “I’m proud of the work our KCRW storytellers do each day and gratified to have it recognized by the RTDNA,” said Gary Scott, KCRW’s program director. “Saying Goodbye to Hollywood Park” was made possible because of the Independent Producer Project, KCRW’s initiative to cultivate and support independent media producers and artists by commissioning both long-term projects and weekly on-air and online content. The Project allows KCRW to take chances on finding new ways and partners to help tell stories that move us. SANTA MONICA, June 24, 2013 — Warren Olney earned Journalist of the Year in the radio category at the 2013 LA Press Club Awards. Of the win, the LA Press Club noted, “Olney and his team did a masterful job of remembering a traumatic period in the city’s history. Great job.” Olney was previously named Best Radio Journalist of the Year in 2001 when his signature show, “Which Way, LA?” also won Best Talk/Public Affairs Show. This year, the “Which Way, LA?” team, led by Warren Olney and Managing Producer Sonya Geis, was also awarded best public affairs show for its special 20th anniversary coverage of the LA Riots. The five show series, which explored how Los Angeles has changed over the past 20 years, featured listener stories, special guests, and an interview by KCRW DJ Raul Campos with band Ozomatli about the riots’ effect on the LA music scene. The series can be found here. In the radio documentary category, KCRW won for “The Couple in 303,” produced by Gideon Brower and Eric Drachman about a quiet, Santa Monica couple who turned out to be gangster Whitey Bulger and his wife. The entire piece first aired on UnFictional and was funded through the Independent Producer Project. The story can be heard here. 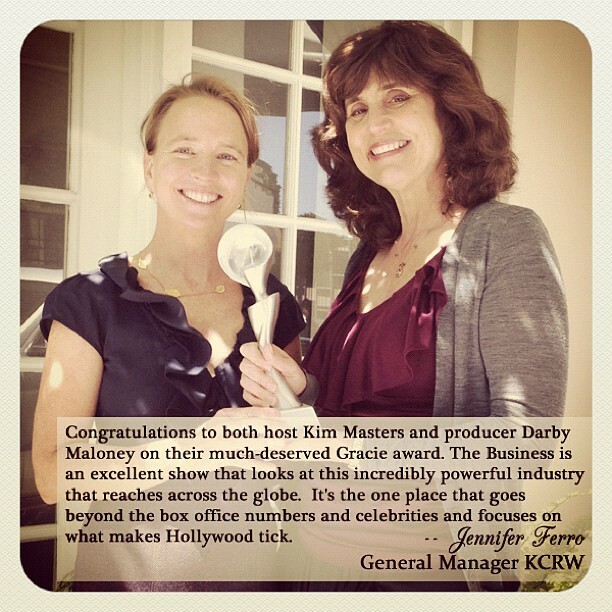 Host Kim Masters and Producer Darby Maloney and of KCRW’s The Business took second place in two categories: Best Entertainment Reporting for “The Hollywood-China Connection” and Best Personality Profile for their interview with “Beasts of the Southern Wild” director Benh Zeitlin. KCRW contributors also won awards at this year’s ceremony. Gene Maddaus was named Print Journalist of the Year for his work at LA Weekly, while Gustavo Arellano won for Best Newspaper/Print Business Feature for his work at the OC Weekly. All 2013 LA Press Club winners can be found here. SANTA MONICA, April 24, 2013 — Two major grants recently were awarded to KCRW for its Sonic Trace transmedia project. The grants include $75,000 from the National Endowment for the Arts (NEA) and $40,000 from Cal Humanities’ 2013 California Documentary Project. This is the first time KCRW has been awarded a grant from Cal Humanities while the NEA Art Works grant is the largest in the station’s history. Sonic Trace, a multi-platform storytelling project, traces people living in the heart of Los Angeles to their origins in Mexico, El Salvador, Guatemala and Honduras, using radio, video and mapping to ask ¿Por qué te vas? ¿Por qué te quedas? ¿Por qué regresas? Why do you go? Why do you stay? And, what makes you return? The inaugural year of the project saw the conceptualization and creation of Sonic Trace’s portable sound booth, local and national radio pieces, a content rich blog and interactive, mapping website. Launched in March 2012 as part of Localore, a nationwide initiative of AIR, the Association of Independents in Radio, Sonic Trace goes beyond traditional story gathering by venturing into neighborhoods on both sides of the border to show how community connects across borders. Through the interactive website, Sonic Trace maps the stories of immigrants in Los Angeles using stories gathered from La Burbuja, or the “The Bubble,” a portable sound booth specially designed for the project. Dozens of contributed stories are embedded on the map, creating a link between LA neighborhoods and cities, towns and villages across the border—creating an interactive, oral-history mosaic of Los Angeles not possible through radio alone. Funding for the second year allows Sonic Trace the opportunity to explore new communities in Southern California, including Orange County and MacArthur Park. In its inaugural year, the program focused on gathering stories in Koreatown and South Los Angeles. The NEA received 1,547 eligible applications for Art Works grants requesting more than $80 million in funding. The 817 recommended NEA grants total $26.3 million and span 13 artistic disciplines and fields, and support the creation of art that meets the highest standards of excellence, public engagement with diverse and excellent art, lifelong learning in the arts, and the strengthening of communities through the arts. Acting Chairman Joan Shigekawa notes, “The National Endowment for the Arts is proud to support these exciting and diverse arts projects that will take place throughout the United States. Whether it is through a focus on education, engagement, or innovation, these projects all contribute to vibrant communities and memorable opportunities for the public to engage with the arts. For more information on Sonic Trace you can visit www.sonictrace.org. For more information on KCRW please visit www.kcrw.com. KCRW 89.9FM, licensed to Santa Monica College, is NPR’s flagship station for Southern California. The Santa Monica-based nonprofit represents cutting edge radio at its best, presenting an eclectic mix of independent music, news, talk and arts programming. The terrestrial signal serves Los Angeles, Orange, Ventura Counties, as well as parts of San Diego, San Bernardino, Kern, and Santa Barbara Counties and the greater Palm Springs area. KCRW’s programming is internationally renowned and available worldwide via KCRW.com, including three streaming channels, 27 podcasts and archives of our locally-produced programs and live band performances. Hear KCRW music online, all the time, on the ALL music stream Eclectic24. In August 2012, the NEA received 1,547 eligible applications for Art Works grants requesting more than $80 million in funding. Art Works grants support the creation of art that meets the highest standards of excellence, public engagement with diverse and excellent art, lifelong learning in the arts, and the strengthening of communities through the arts. The 817 recommended NEA grants total $26.3 million and span 13 artistic disciplines and fields. Applications were reviewed by panels of outside experts convened by NEA staff and each project was judged on its artistic excellence and artistic merit. For a complete listing of projects recommended for Art Works grant support, please visit the NEA website at arts.gov. The California Documentary Project (CDP) is a competitive grant program of Cal Humanities. CDP grant awards support film, radio, and new media projects that document the California experience and explore issues of significance to Californians. Through its California Documentary Project, Cal Humanities has granted over $2.7 million to projects since 2002. Cal Humanities is an independent non-profit state partner of the National Endowment for the Humanities. For more information on Cal Humanities, please visit www.calhum.org. For more information on Sonic Trace you can visit the Sonic Trace blog and Sonic Trace interactive website. For more information on KCRW please visit www.kcrw.com. SANTA MONICA, CA, May 23, 2012 – KCRW (89.9FM and KCRW.com) radio program The Business has received a 2012 Gracie Award for “Outstanding Talk Show” in the entertainment and information categories among the local, public, online and student winners. The weekly show was recognized by the Alliance for Women in Media Foundation for its excellence in programming for, by and about women. 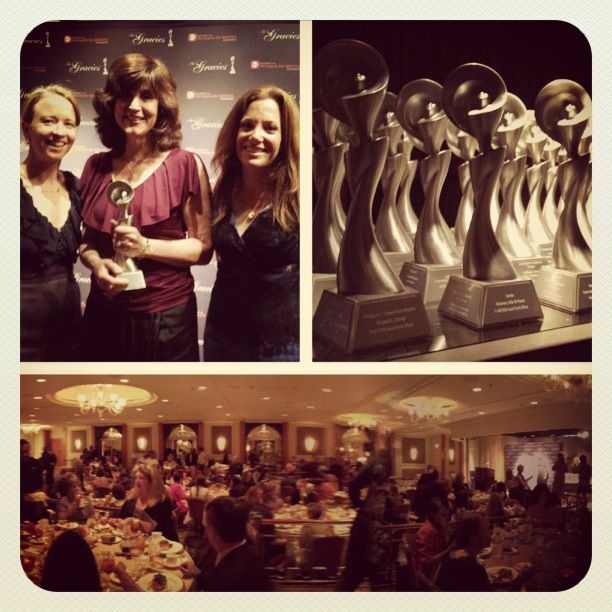 Winners were recognized at the Annual Gracies Luncheon, held at the Beverly Wilshire Hotel. Led by a dynamic female duo, The Business explores “the business of show business” going beyond the glitz and glamour of Hollywood to reveal the inner workings of the entertainment industry. 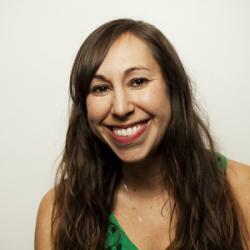 Host Kim Masters, who also serves as Editor-at-Large of the Hollywood Reporter, was awarded Entertainment Journalist of the Year by the LA Press Club in June 2011 for her work on The Business. Darby Maloney, a producer of the show since 2007, has received both a Golden Mike Award and a National Entertainment Journalism Award for work on the program. Launched in June 2004, The Business has become a KCRW mainstay. Highly regarded in the entertainment industry, The Business features an analysis of top Hollywood news with John Horn of the Los Angeles Times, in-depth interviews and the occasional feature story. A variety of notable guests have appeared on the show including, Matt Damon, Morgan Spurlock, Werner Herzog, Randy Newman and Jimmy Kimmel to name a few. The Business airs on KCRW Monday afternoons from 2:30-3:00pm PST. It can also be heard on public radio stations across the country, and worldwide, including WNYC, New York and WDET, Detroit. For more information on The Business please visit www.kcrw.com/thebusiness. 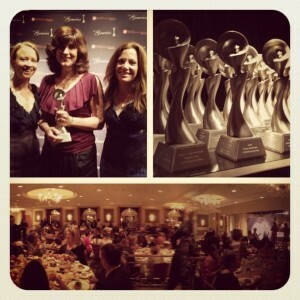 KCRW Celebrates the Gracie Award for "The Business"